You can select a variety of sizing and layout options for your document or photo on the Page Layout tab. To change the size of your printed document or photo, select the Reduce/Enlarge Document checkbox and select sizing options. To print on both sides of your paper, select the 2-sided printing options. 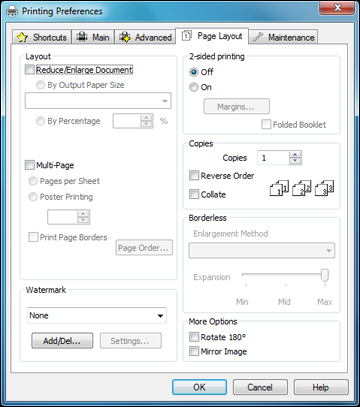 To print multiple pages on one sheet of paper, or print one image on multiple sheets of paper, select the Multi-Page checkbox and select the options you want. To adjust the automatic settings, select Auto Expand as the Enlargement Method setting, then adjust the Expansion slider (if necessary) to control the amount of image expansion. To print the borderless image at its actual size without scaling, select Retain Size as the Enlargement Method setting. To add a watermark to your printout, select Watermark settings. To rotate or flip the printed image, select the Rotate 180° or Mirror Image checkboxes.